Pete Johnson and Don Pepin Garcia continue their buzz-heavy collaboration with the recent release of the über-potent Fausto and the intriguing La Casita Criolla U.S. broadleaf puro. I found the strength to live up to the hype. Even so, it snuck up on me the first time because the blend is very smooth with the sort of deep, rich flavors common to Tatuajes. Kicking off with heavy pepper, there were also some hay notes that I tend to associate more with Connecticut than Nicaragua, which is the home for the filler and binder. Perhaps they came from the Ecuadorian Habano maduro wrapper. About one third of the way down the six-inch stick, the pepper lightened up a bit, allowing some dark fruit to come through. And in the final third, there was a thick woody component. With a 50-ring gauge the Toro is a comfortable smoke. At about $8.50 a stick, it’s slow burning treat. This is a cigar about which I expect most smokers will have a strong opinion. It certainly stands out, from the rough, thick wrapper to the dark, gray ash. Not to mention the taste, which I found to be earthy, somewhat sharp, and occasionally harsh. I’ve only smoked a couple and don’t know if I’ll go back for more. At around $7 for the Corona Gorda (5.6 x 46), the price is reasonable. These two new releases are a result of Tatuaje’s willingness to experiment and create new tastes and experiences for smokers. I think that’s great. Of course, every cigar isn’t going to please everyone. But you’ll be missing out if you don’t give these a try. I preferred the Fausto, though its power will probably make it an occasional choice. La Casita was more unusual, and I thought it lacked the depth and nuance of most Tatuaje smokes. I like this feature. Would be interesting to see some cigars compared across manufacturers (like, say, two different Cameroon-wrapped cigars, or two budget Connecticuts, etc.). Keep up the good work. I love this feature. Great idea! I'm not seeing anything else like this elsewhere in the cigar community, so I too welcome this new feature. Looking forward to more Face-Offs! Thanks for the suggestions. Keep 'em coming! 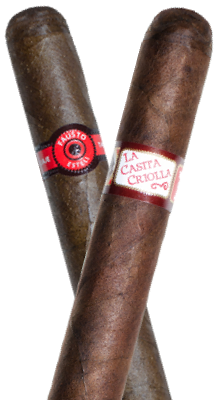 Personally I love the La casita criolla and didn't care as much for the fausto. To each his own i guess! A Flor la Dominica by Rosa Cuba and a Curlyhead Deluxe by Arturo Fuente are similar in taste. I would recommend either one; maybe leaning towards the Rosa Cuba. Great idea on the face off. I tried both back to back when they became available at my B&M, also preferred the Fausto but thoroughly enjoyed both. Agree with review of fausto, didn't get any harshness from my casita criolla though- nutty heaven for me! Can't wait for more face offs!